It is more usual for a patient to approach their team to enquire about pump therapy. In many cases you will be fobbed off with excuses, e.g. you are already on an intensive regime (MDI) so a pump will be of no greater benefit, a pump would not suit your lifestyle, a pump is no good for needle phobics, we are unable to provide training, there are more needy people than you, we don’t have funding for pumps, you don’t meet guidelines, you are too old, you are too young, you don’t have the intelligence to use a pump, you are too well controlled, you don’t have good enough control – to name but a few of the excuses reported to us! Unlike England and Wales who follow NICE mandatory TA’s (Technology Appraisal) Scotland’s Health Boards do not have clear guidance they must follow. Each board may have their own guidance, but it is just guidance and not mandatory. Scotland have publicly committed to NICE TA 151, but only some boards clearly follow this guidance while others may just consider it and others not follow it at all. SIGN Guidelines are also used in Scotland, read CSII p33 of SIGN 116. In 2012, after a long campaign by several interested individuals and groups, The Scottish Government released a statement regarding the future provision of insulin pumps. On 27th Feb 2012 the Government reaffirmed their position on pumps by releasing a statement of targets they have set out for Scotland. We were very pleased to see the targets, however some concerns came to light, read Diabetes UK Scotland’s letter to the Petitions Committee for more information. A letter was sent to each Health Board Chief Executives (CEL 2012 04) with full details of targets and what is expected of each board. We were pleased at the targets as a starting point, which states that by March 2015, Scottish NHS Boards will almost triple the number of pumps available to people of all ages with type 1 diabetes to more than 2000 (inc. 25% of young people under the age of 18 using an insulin pump) We hoped to see pump provision continue to increase significantly in Scotland – unfortunately this has not proved to be the case. On 29th March 2012 Humza Yousaf, SNP Glasgow received a response to his PQ, which again reaffirmed the government’s commitment to pumps at this time. Since the completion of the 3-5 year strategy to meet targets set by the government many areas have reverted to minimal pump provision, and in some areas allocating less funding than before 2012. 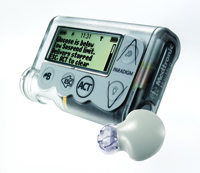 Read our benefits and disadvantages of Insulin Pump Therapy which will help you determine if a pump could be for you. Can you carb count and adjust insulin to match food, exercise, illness etc? Are you willing to do frequent finger prick tests and keep records? Are you willing to keep in close contact with your health care professionals? Read the NICE Guidelines, do you meet the criteria? Do your homework – join forums and support groups to hear personal experiences of pump therapy, Read INPUT and Insulin Pumpers websites. A good group for parents of children with diabetes is the UK CWD Facebook Group for information and support. Or join us on Facebook, we have two groups, a pump group and a general Group – Type 1 Diabetes in Scotland. A pump is not a magic cure, however the vast majority of people will find a good improvement in their control over MDI if they have the motivation and commitment to make the pump work for them. If you feel you would like to go ahead with a trial of insulin pump therapy the next step is to approach your care team. To help us get a clear picture of what is happening all over Scotland please join us on Facebook. We hoped for a bigger commitment and one which included CGM, details of this have now been released however we will continue to campaign for equal access to pumps and technology no matter where you live. Plans for the £10 million pledged by the government in 2017 can be found here. This will be spread over a 4-5 year period.